I love Thanksgiving! I find it very easy to recall many wonderful memories of my childhood spent in rich and living color with my family as celebrated this holiday. And every year is a new chance to add to those memories by SHARING the time away from work and school with each other which of course now includes my own children. All to often today sharing is defined by my last update on Facebook, Twitter or Instagram, not as being present. Last week I read a blog by Randi Zuckerberg the former CMO of Facebook titled Stop Sharing on Thanksgiving . Her suggestion of unplugging on Thanksgiving is very appealing and the more I thought about it the more it made sense. This is Thanksgiving and spending time together is important … in fact spending time with those we love if probably the most important thing we do. It shows we are thankful for the opportunity to do so. If my time and attention is taken away by thumbing through several hundred “Happy Thanksgiving” messages from friends what am I saying to my family … It says that someone who I’m linked to on Facebook just because we happened to go the same high school 20 years ago is more deserving of my time and attention than you are. That is something I’m not willing to say. So I’m unplugging for Thanksgiving. No Facebook updates, no Twitter Posts, and perhaps the most difficult … no Fantasy Football Score Updates. I will have my phone but will be careful to only used it for pictures … pictures of the time spend being with my family. Happy Thanksgiving to You, I hope you’ll consider sharing your time with your loved ones too. I love the holiday season. It’s a great time to look back on the previous year and think about all we have accomplished. We get to spend more time with our family and friends celebrating the season and making rich new holiday memories. Unfortunately those memories are often accompanied by buffets of rich food, decadent desserts, holiday parties and lavish luncheons. Pair that with the lack of time for anything that resembles physical activity and we will all gain a few unwanted pounds during this season. Which leads to the next very predictable tradition … New Year’s Resolutions. Now I’m a technology guy, which includes the on-again-off-again use of Nike+ applications for training but it had never occurred to me to find an app that included an actual PLAN for training you to go from the Couch to Running a 5K. So I found the 5K Runner: 0 to 5K Run Training App. And another that promises to build you up from 0 to 200 Situps. So I’ve decided that while I’m doing the 0 to 5 K Program why not incorporate the other apps for push ups and sit ups as well and use a total fitness program completely driven by my iPhone. I’ll document my results here on Kofacts.com to see if these applications are effective. Are there other apps that I should consider adding to my training program? Hopefully, I don’t come to loath my phone when it reminds me that I’ve got one more set to do. Ride the Lightning? That will be $29, please! ≈ Comments Off on Ride the Lightning? That will be $29, please! Yesterday Apple announced the release of the iPhone 5 which included the revamping of the power and sync connection from a 30 PIN socket to a new branded socket called Lightning. This represents the first time Apple has changed the connector that has existed for 9 years to connect their devices to everything from chargers to clock radios and stereo systems. They announced that there would of course be an adapter that would allow you to continue to use the cords and devices you’ve already purchased. Today I went online and found this on their store. 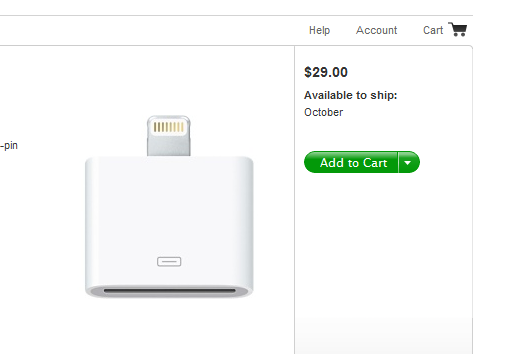 Apple wants $29 for the adapter, WHAT?!?!?!?! Are you kidding me? For something that probably costs a $1 to make? No wonder some are saying that Apple could make $100M off the connectors alone. But now they are hearing from their customers on social media who are aghast at the added expenses. 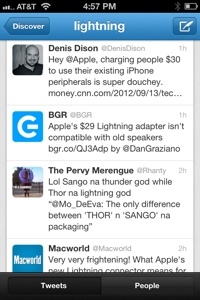 This is a huge opportunity that Apple has squandered. If you assume that they did indeed have to change it to create room in the new device, why not include one adapter in each new iPhone you sell? 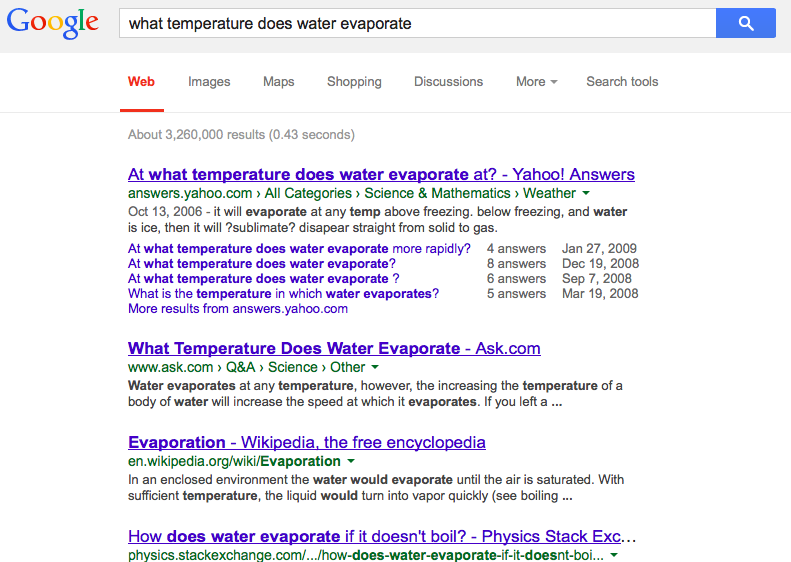 After all even Dell did that as they were transitioning from a PS2 Keyboard Connection to the USB …. you got an adapter in the box. Their fans would have fallen all over themselves pointing to what could have been a huge customer service win. Did Lewis and Clark Complain? 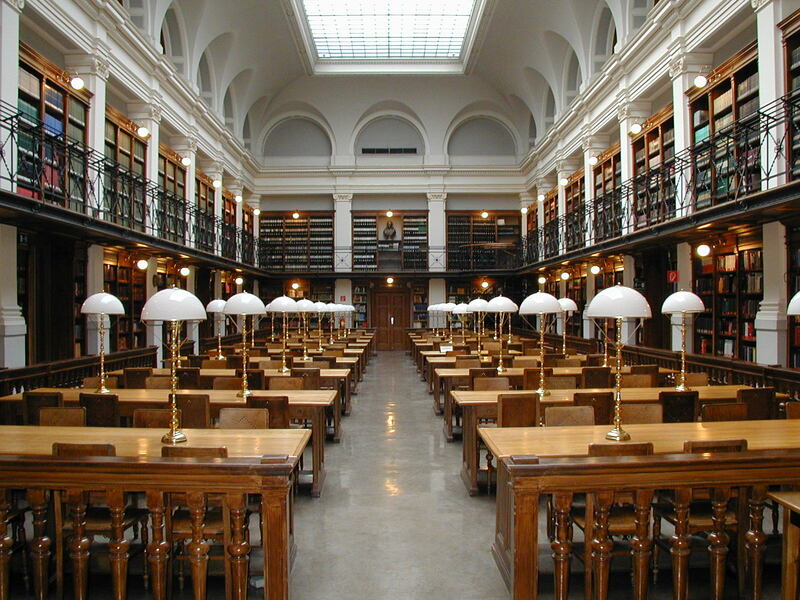 ≈ Comments Off on Did Lewis and Clark Complain? It was just a little over 200 years ago that Lewis and Clark set out from St. Louis following the Louisiana Purchase to find the Northwest Passage. The journey would take more than two years and force the Corps of Exploration to endure two harsh winters. Eventually finding the Pacific Ocean near present day Portland, Oregon. By contrast, today I find myself following nearly the same path … of course I’m jetting from Raleigh, North Carolina to Seattle, Washington in less then 6 hours, while enjoying movies and internet access at 30,000. I wonder if Lewis and Clark complained as much as we might be inclined to about the hardships for our trip? Of course they had to contend with unforgiving weather and hostile native peoples, but come on we’re dealing with crying babies, spilled drinks, slow internet connections and the occasionally un-friendly stewartesses. So what’s become of us? Has our ability to endure been so diminished? I mean we can post new blog messages from 30,000 as I’m doing right now. What do we have to complain about? We should be amazed at what we can do! This is a test blog entry from my new MacBook Air using the MacJournal application. I’m adding a photo from our vacation over Thanksgiving. This photo was added with no sizing changes. How does it appear on the site? I had to change the image sizes manually so they weren’t fixed larger than the page allows. ≈ Comments Off on What would you do if you could not fail? This is a truly inspiring video from TED done by Regina Dugan from DARPA. 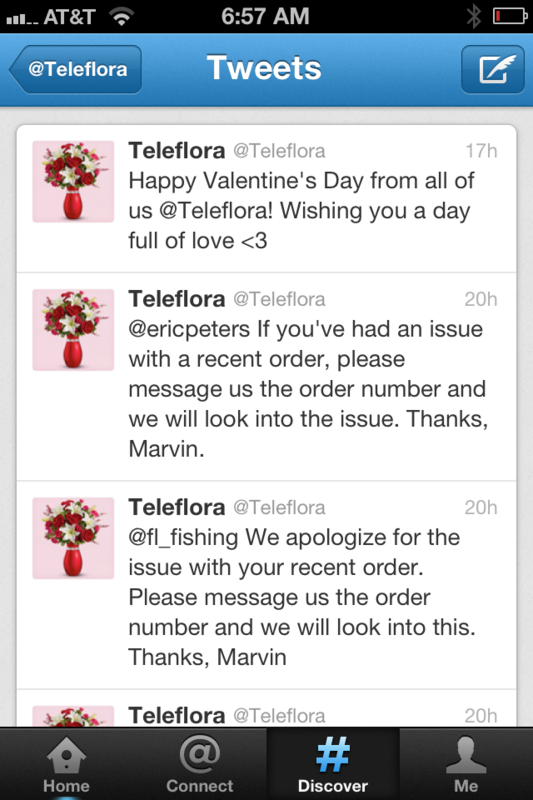 Teleflora – An Epic Social Media #FAIL – Updated! Three weeks ago red blooded American males were gathered around our TV’s in celebration of that most American event called the Superbowl. The game of course is not only celebrated for the football that will be played, but for the foods that are eaten and the commercials that are run. Suddenly, hundreds of thousands of men decided they needed to buy flowers for Valentines Day. Me included, and for the added surcharge you to could “Give” on Valentines Day and make sure your flowers (and chocolates) arrived on the big day. Fast forward to the big day. I thought it strange that during the day I never got the message from my wife that “The flowers came they are so beautiful ….” instead by the time I got home at 6pm still no flowers. Checked my email nothing from Teleflora about any delays. 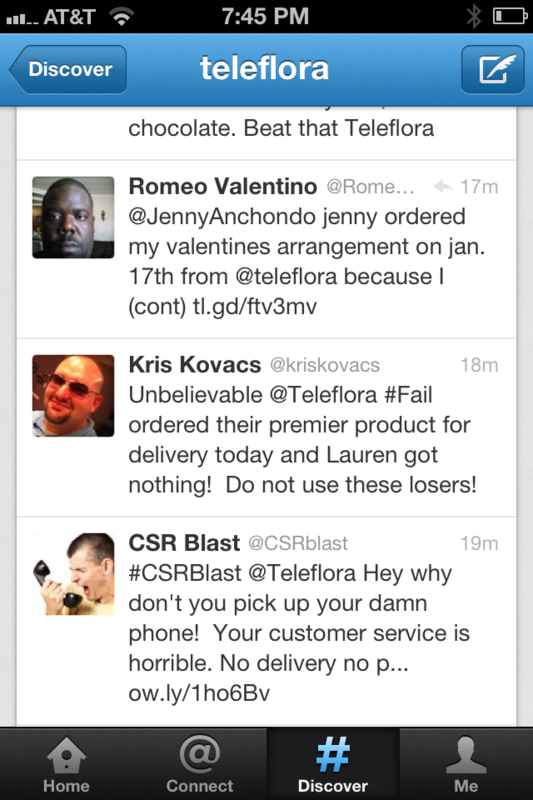 But when I checked Twitter there was an explosion of people complaining that Teleflora was emailing them that night and saying that they were not going to be able to deliver their flowers … despite in many cases them being ordered just a few minutes after the airing of their million dollar ad during the Super Bowl. In real time more and more complaints were being added by the second. It wasn’t in just one place in the country it was happening everywhere. And all along Teleflora was silent. As a tidal wave of negative publicity was sweeping over Twitter they were silent. And Twitter became a feeding frenzy with links being sent out to media and reporters asking for someone to look into all of the money that Teleflora took from people and never delivered. I know someone that’s gonna have a tough day. Marvin you should call in sick today, cause you are going to be on BLAST! So it goes without saying that you should never buy any flowers from Teleflora ever … they can deliver a great Super Bowl ad, but they can’t deliver on the Super Bowl of Flower Days. 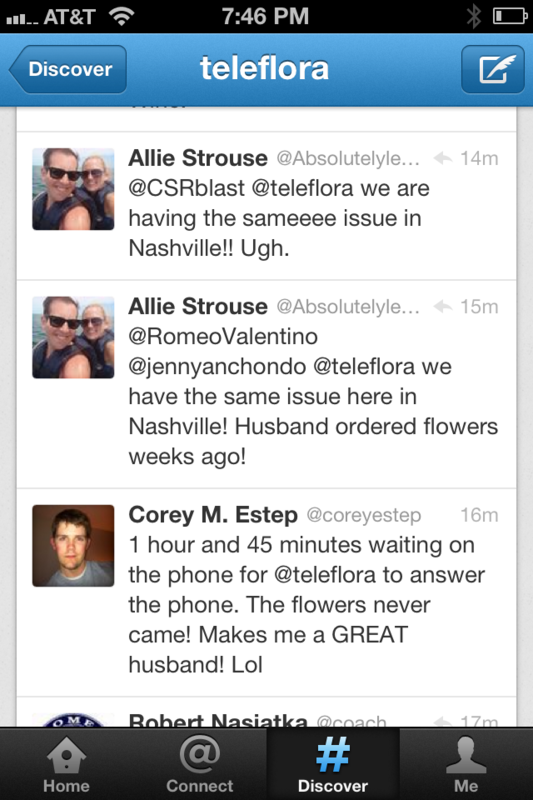 Unlike Teleflora every company today has to be monitoring Social Media and when something goes wrong you have to engage. 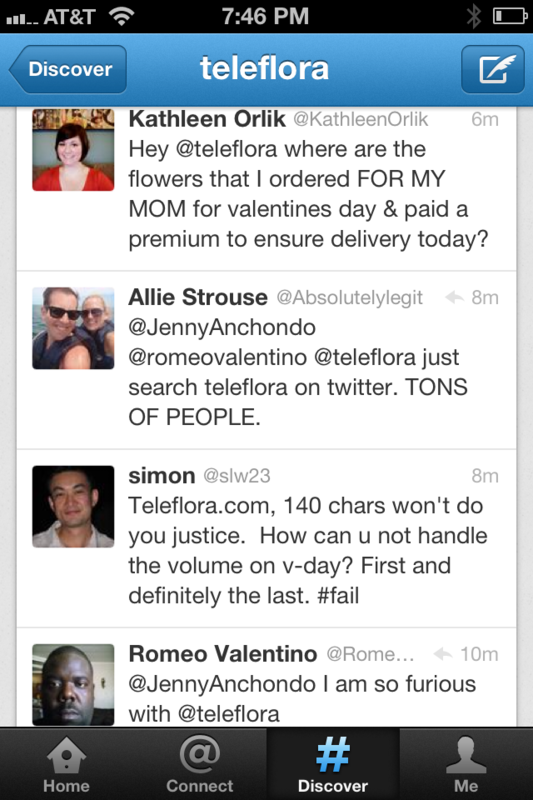 To see just how big a failure this was, if Teleflora took you money and you didn’t “receive” add your name and order number to the comments section of this blog and we’ll keep a running total of just how many Valentine Days they ruined!